Sophisticated space-pop quartet White Laces' evolution has seen fronter Landis Wine and his cohort gradually bend the band's aesthetic and vibe ever closer together, as if attractive chrome pipes in parallel, the culmination of which is this atmospheric, seductive debut long player Moves. The Richmond-based act has over the last three years (during which time it released a number of singles and EPs) analytically assessed and discarded every superfluous element of its sound, and, in theory, one would think only a raw, punk-derived kernel would remain following such an exercise. But instead White Laces' efforts have revealed a sleek, soft-edged, melodic core that breathes within its own carefully conjured, fluid ambience. The sonic exploration has paid off, as Moves is one of the most promising full-length debuts of the year. The music on Moves -- with its spare attack, off-center but ready hooks and remarkable sonic depth -- has contemporary peers such as current scene darlings Diiv. 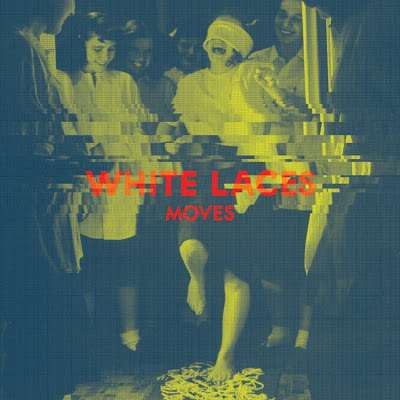 But White Laces' influences are far more seasoned: think "Dreams Never Fade" or "Procession" from the painful transition that birthed New Order from Joy Division; or think the casting about The Cure did between Seventeen Seconds and The Top. Mr. Wine's vocals on the album opener "Trading" -- whose first line is "I know I won't wake up..." -- are certainly reminiscent of Robert Smith's in his more subdued earlier years. Nine largely asymmetrical song structures downplay the delineations "verse," "chorus" and "bridge," not because there are no clear focal points for the songs, but because White Laces operates at an elevated level that de-emphasizes such divisions and instead traffics in masterful shifts in vibe and groove. The concluding minute of "Impossible Windows" fires off mismatched clutches of snare beats to create an unsteady groove that will delight and confuse pogoing show-goers. Cascades of '80s-echoing synth color the chorus of "Carrousel" (not a typo, but a song named for the planned execution of those who turn 30 in the classic distopian sci-fi flick "Logan's Run"), while Mr. Wine's layered vocals billow out into cinematic space. Album highlight "Invocation," a stream of which is embedded below, reiterates in its opening section White Laces' long-held appreciation for motorik rhythms, which steadily pulses en route to an electrifying chorus that temporarily halts the movement of the song and apparently name-drops The KLF's biggest jam. Moves closes with the preview single "Crawl/Collapse," a spectral rocker whose spiraling denouement, perhaps more than anything else on the new collection, frames the brilliance of White Laces. Stream "Crawl/Collapse" below. One final note: every band is layering on the reverb these days, but White Laces stands almost alone with its keen approach to imbuing its aural spaces with pronounced musicality. Much of the ambient sound on Moves was created the old fashioned way, via tracks pumped into a room over monitors and recorded as the band played live, a sort of modern reiteration of techniques pioneered by the great Les Paul. That vintage candy coating rests upon a decidedly post-punk frame, as we've stated supra. Moves will be released by Speakertree Records Sept. 11 as a digital download and LP; the first 100 of the 500 available physical copies are pressed to green vinyl. Local fans should mind our club picks in the sidebar, as White Laces is planning at least one Boston date for the mid-fall, and we'll be sure to post what we know once it can be revealed.